There’s lots of text on the blog at the moment. Time to add a little bit of colour with some links that have been floating around the studio. Golden Hook is an innovative fashion brand which allows you to create made-to-order beanies by choosing your beanie style, material, and color. You also choose the authentic grandmother who will knit your beanie from our gallery of grandma photos. Authenticity being sold through choice – and a personal connection to whoever’s knitting your new hat. Fun, although if Goldenhook is anything to go by, Granufacture isn’t very cheap yet. Meat styluses. I really have no sense for the Korean market: might this be a hoax? No idea; it doesn’t seem so, given the coverage. And it definitely works, as this video of someone playing Taiko Drum Master with a pair of sausages demonstrates. 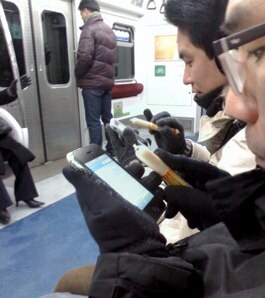 That’s one way to keep your fingers warm. Matt Jones sent this to the studio mailing list last week, and it was destined for the blog from the get-go: a beautiful collaboration between Lego and MUJI Japan. It’s so simple: a model made out of a combination of Lego pieces and what look like origami squares, with pre-punched holes for joining the paper to the bricks. And: what a cheery crocodile. In his video, the home becomes another space for being advertised to in – with the catch that the more advertising you choose to be subjected to, the more revenue you’ll generate. The glitches in the AR system, and the horrible Girl From Ipanema cover are the icing on an entertaining (if somewhat bleak) cake. Last week’s links slipped over into this week’s. If you read Matt’s weeknotes for last week – week 242 – you can probably understand why. But! Better to be late than to forget them. I loved Reknit: a site for turning unwanted woolen goods into new products. You send off an unwanted pullover, it gets unravelled, and sent back to you as something new. This month, it’s a scarf; next month, you’ll get something else based on a vote (in the running: a beanie, iPod case, cut-off gloves, or socks). If you don’t have a sweater to recycle, the site even offers to find you your nearest Goodwill store, where you can no doubt buy many new, old, scarves. This isn’t a large-scale industry, though; it’s the creator’s mother. And that’s the bit I really love, encapsulated in its tag line: this month, my mom will turn your old x into a new y. It won’t ever be a big operation, but it opens up her knitting to a slightly wider audience than the rest of her family. Lovely. Matt Brown coined something similar in the studio last week: small scale Gran-ufacture. On a slightly more sombre note, Matt Jones sent this image to the studio mailing list, from a 2007 New Scientist article on the depletion of Earth’s natural resources. The stat that really caught our eye was the dwindling resources of Indium. Indium’s a critical component of LCD displays, and whilst, obviously, other screen technologies are available – and will continue to be developed – Matt noted that it’s a reminder that non-screen-based interactions (like those in Availabot or made possible through RFID) have an environmental value as well as a technological one. 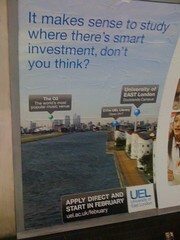 The picture on the right is an advert I saw on the tube last week, for the University of East London. We write a lot about Augmented Reality on the blog, but I always assume we’re coming from a technologically informed/privileged position. So when I saw this on the tube, I did a double take; this is a faux-AR image of the Thames, with UEL facilities and landmarks picked out not only by map-pins, but also glassy iPhone-style bubbles. Perhaps the point of reference is meant to be mapping, but the combination of the popups with the photograph feels exactly like AR to me; the idea that AR was already a usable metaphor for advertising was very surprising. It’s also a reminder of the ability advertising has to introduce new concepts, rather than just illustrate old ones. It’s not all serious links about Augmented Reality, or the Earth’s dwindling resources, on the studio mailing list, though; there’s also a decent amount of “here, look at this!“. It’s alright to like pretty things. I found this video from friend-of-BERG Alex Jarvis, and just had to share it. Ingenious animation, beautiful sketching; seems like the right thing to end these links with.